Have you ever asked yourself, how to make super creamy though authentic Tiramisu Ice Cream Cake? Then I have good news for you. I show you how to make authentic Tiramisu in an ice cream cake form. Ridiculously easy to make. Just 6 ingredients. Ice cream and summer is literally meant for each other. It belongs to each other like peanut butter and jelly, cinema and popcorn, or birthday and cakes. Summer is definitely the best time of the year. I think it’s not just me when I say that I feel much better with rising sun hours. It’s not that tough to stand up in the morning when the sun is already shining, and you don’t freeze when you get out of the house. Everything is positive when the sun kisses you. The world is yours. Everything seems possible. Enough staying-at-home-because-it-is-cold-and-rainy-outside-days. Hello let’s-get-active-outside-days. With being outside as often as possible, my cravings for cold desserts are rising like a rocket. Because Tiramisu and also ice cream are two of my most favorite cold sweet yummies, I wanted them to come together. How to make Tiramisu Ice Cream Cake? You just need 6 ingredients. Ladyfingers, mascarpone cheese, powdered sugar, high-quality vanilla bean ice cream, coffee, and cocoa. Beat mascarpone with sugar and ice cream until smooth and creamy. Then dip ladyfingers into coffee. Make sure that you just dip them shortly into the coffee instead of soaking them. Well, that’s it. Arrange them in a loaf pan and freeze them. After a minimum of 4 hours chilling your creamy Tiramisu Ice Cream Cake is ready for you. Dust with cocoa before serving. I highly recommend using high-quality vanilla bean ice cream. The ice cream adds so much flavor to this dessert and is strongly present. It’s like using chocolate chips instead of chocolate bars for S’mores. You know what I mean? As I mentioned before, I mixed mascarpone with high-quality vanilla bean ice cream. Original Tiramisu uses ladyfingers, mascarpone, egg yolks, sugar, coffee, and cocoa. To let them as original as possible, I just replaced egg yolks with ice cream. Because of using real ice cream instead of heavy cream or something like this, the Tiramisu Ice Cream Cake is extremely creamy. Like ice cream should be. But firm enough to stay in a cake form. Take it out of the freezer 10 minutes before serving. Nothing more to say at this point. Ok, maybe just one more thing. Do you see the picture below? I don’t need to say more. If you try this Tiramisu Ice Cream Cake recipe leave a comment, rate it and tag a photo #alsothecrumbsplease on Instagram! Would love to see your snap! 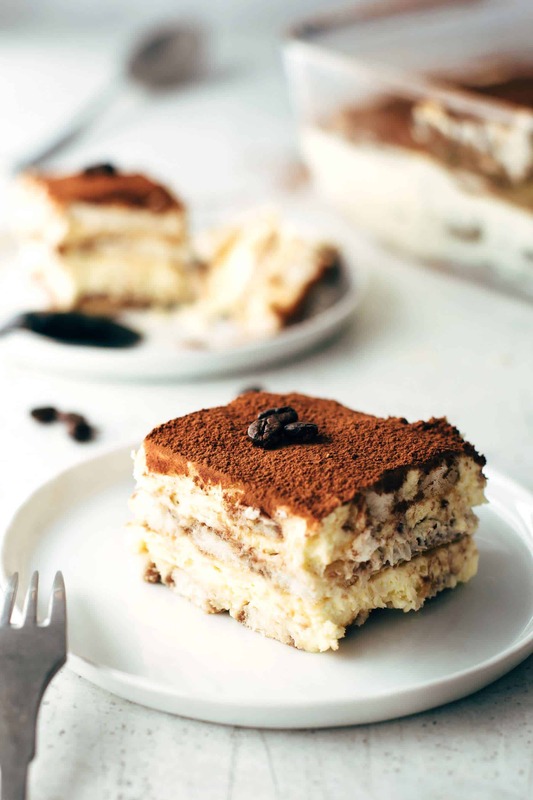 You may also like Authentic Italian Tiramisu, Black Forest Cake, Strawberry Rhubarb Pie, Lemon Custard Bars, or click here to see all things sweet. Line an 8-inch loaf pan with plastic wrap with a 3-inch overhang on the sides. Beat mascarpone cheese with sugar and vanilla bean ice cream until combined and smooth. Set aside. Dip 1/3 of the ladyfingers into coffee and line the bottom of the prepared pan. Then spoon 1/3 of the mascarpone creme onto ladyfingers evenly. Repeat two more times. Cover with plastic wrap. Freeze for about 4 hours until firm or up to 1 week. Remove plastic wrap and let stand for 10 minutes. Sprinkle with cocoa before serving.